Harlock and his crew of space pirates save the world from the Mazone invasion. This is the third Leiji Matsumoto anime I’ve finished, after Yamato and Arcadia of my Youth. It has the same elements that made me come to enjoy his other series: awesome space battles that are basically naval battles but in space, the sense of destiny and fighting in the face of certain loss, and an excellent musical score. I rated this a B+, and Yamato an A-, but I actually enjoyed Harlock more. I know, my rating system makes no sense. The thing is, after watching Yamato and Harlock, my excitement over all the cool spaceships has started to diminish. The novelty effect has worn off. If I were to rate Yamato again I’d probably give it a B. 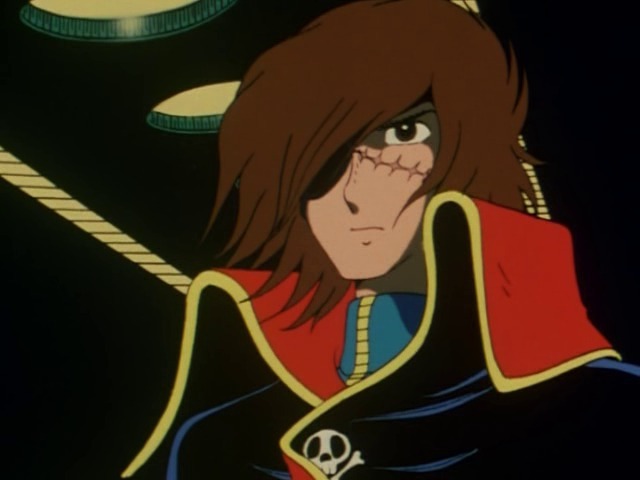 Regardless, the thing I like about Harlock over Yamato is the story’s structure. Yamato is pretty repetitive. Go to some planet, meet some aliens, blow up some aliens. Harlock’s episodes also tend to end with blowing up aliens, but there’s much more of a direction to the story. For a while they’re trying to rescue Mayu, at the beginning they’re trying to figure out who the invaders are, etc. There’s a stronger structure to the story. My biggest pet peeve is the show’s portrayal of gender roles. You can tell it was made by somebody who was old in the 70s. That sort of adds to its appeal though. Also, I’m not sure why all of the fanservice in the show centered around the five year old girl. Storytelling – A – Doesn’t waste time, that’s for sure. Voice – B – Leiji’s semi-mythical style. Characters – B – Takes the one-episode-per-side-character approach. Attention Grab – A – I was often surprised to find an episode was over already. Production – B – The animation has not aged well, but the music is excellent.